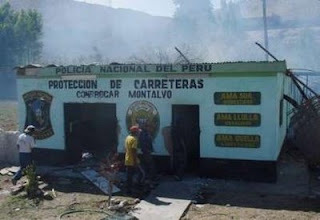 Moquegua, Peru - Poor residents of the copper-rich southern state of Moquegua have taken 48 police officers hostage, as well as captured and burned a police station. Police were attempting to disperse a blockade of the country's main highway to Chile, the Ilo smelter, and the American-owned Southern Copper's Cuajone mine - the country's largest copper producer. Demonstrations began a week ago as an effort to gain control of local natural resources which bring little benefit to the majority of the people in the region, 30 percent of whom live in poverty. Union miners at the Cuajone mine exacerbated the crisis by staging a two-day strike that coincided with the blockades. In the neighboring Arequipa province, workers have been off the job at Peru's third-largest copper pit, Cerro Verde, for more than a week. The miners are demanding increased benefits. President Alan Garcia's chief of staff, Jorge del Castillo, said that he could not negotiate with the protesters while they possessed any advantage, and urged them to release the hostages. Some feel that the unrest could easily spread to other provinces before the standoff is resolved.